The dreaded undead legions of Nehekhara are rightly feared throughout the land for their perseverance. At the behest of the Tomb Kings they strive to take revenge on the great necromancer Nagash for cursing them to undeath eons earlier. Why, then, is there a jolly bunch of them on a boat raiding shipwrecks for treasure and invading pirate havens for loot? Every faction in Total War: Warhammer 2 feels different, but only the Tomb Kings DLC made me feel as though I was playing a different game entirely. Namely: Heroes of Might and Magic. I have always thought of Total War as a 4X/RTS hybrid about long-term strategic planning and spectacular tactical battles, but Rise of the Tomb Kings adds crafting, a more detailed item system, special heroes and hordes of free skeletons that let you raise a 20-stack army in just a few turns without tanking your economy. The resulting shift of responsibilities turns the game into an RPG about looting, exploration, and XP progression. I was hit by a sudden wave of Heroes of Might and Magic nostalgia as I sailed around duffing up pirates with my ship full of bony fellas. Because Tomb Kings don't have to worry about balancing an economy to feed armies, you can amass enormous amounts of wealth. And because you can raise and maintain forces so easily, the things you normally have to worry about —public order, rebellions, invasions—are also less of a concern. Instead you're free to faff around on the high seas, bully nearby Bretonnians, level up your heroes and play with a more cavalier attitude. You don't even have to worry about the vortex because the Tomb Kings are on a separate mission to recover the books of Nagash scattered around Nehekhara. In Heroes of Might and Magic your military power is centralised on one hero character who runs around with a retinue of warriors. When you run into enemies you drop into turn based battles. You use the treasure you earn beating up monsters to add new structures to your home city and recruit new units. In Total War: Warhammer 2 your fortunes are spread between a number of cities and you can have multiple armies, but the reward loop feels the same and Warhammer's wildly varying races create a similar sense of discovery. Your Tomb Kings tend to stick around for a long time as well, which means they are moving up their skill trees, unlocking new spells, and growing into powerful individual heroes. Heroes that are mighty, and indeed magical. You want to keep going back to your castle in Heroes of Might and Magic to do housekeeping. The Tomb Kings also love going home after each adventure. They get lots of bonuses to movement in their own territory, and you can spec them to regenerate extremely quickly if they are hanging around in their home provinces. Instead of worrying about upkeep and recruitment, as other factions would, you spend more time as Tomb Kings managing attrition. If your necromancers can efficiently regenerate units between battles then your forces can keep on roaming out towards the edges of the map. Otherwise I have been bringing them back home between escapades to recoup and take on as many giant robot scorpions as my cursed vaults can produce. As a result the Tomb Kings behave like questing heroes rather than typical Total War conquerors. However far you travel, you always need to come back home in the end. Nagash's black pyramid squats in the centre of Nehekhara waiting to be unlocked. It's a really neat experiment for Total War. 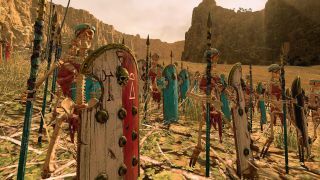 The Warhammer games have given The Creative Assembly some leeway to mess with the Total War formula, but you always tend to see the most experimental moves in expansion packs. I'm really enjoying the DLC because it feels like CA has made another game inside the game, and it does a great job of adding new features without overwhelming you with options. It adds crafting, but eases off on empire admin, reforming Total War into something quite different, and yet strangely familiar.